Loads of shades and types, every mix is random so impossible to give a breakdown hence the price we are selling them. We only have a small number of lots so when they are gone they are gone. See picture for average mix you will receive. 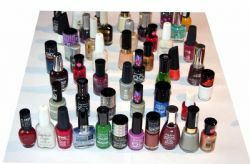 Will include brands such as Rimmel, Revlon, Sally Hansen, Maybelline, Collection, NYC, Astor, Mememe, Manhattan and other similar brands.